The package in the enclosed example workspace queries the operating system and tries to retrieve a number of properties about this. The OS detection logic has been extracted from there and put in here. It has been completely rewritten in a way that makes it more versatile and easier to use. The property peOSVersion should be used if you want to run code that depends on a specific OS version. call. (Vista and up) Knowing the OS version is Vista is OK for now. Special thanks to Mertech Data for allowing me to share this code with the community. You can also get edition info such as, Home, Tablet, Starter, Multimedia Center, Embedded, Datacenter, enterprise, web edition... etcetera..
Windows NT and up: Contains a string, such as "Service Pack 3", that indicates the latest Service Pack installed on the system. If no Service Pack has been installed, the string is empty. Windows 95: Contains a null-terminated string that provides arbitrary additional information about the operating system. 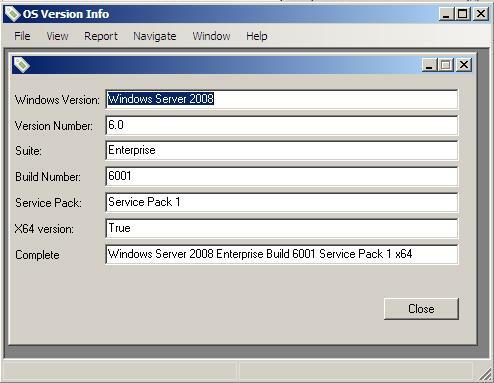 Identifies the major version number of the latest Service Pack installed on the system. For example, for Service Pack 3, the major version number is 3. If no Service Pack has been installed, the value is zero. The psSuite string only contains features which can be enabled or not, so it is NOT a direct mapping to piSuiteMask. An example of this is if you are in a remote desktop session or not, or if you have administrative privileges. Both are not recommended platforms for business (networking is limited). Does your user run with administrator rights or not (Windows 2000 or higher) When running under an older OS, it will always returns false. This then returns a string as in the "Complete" form at the bottom of the screenshot here.